At the beginning of March, the World Poker Tour (WPT) held its annual event in my back yard — at the Bay 101 in San Jose — and I felt like I was ready to play some great poker. I had just won four heats out of seven (with six players each in them) in England, and I had a close call in Tunica at the last WPT event that I played in. I came in my customary 90 minutes late and began my day using extremely tight tactics. Why not play a super-patient strategy, especially up here in Nor Cal, where they’re known to play big pots with weak hands. Another reason to play patiently was that this was a bounty tournament, and I was a bounty; meaning that whomever knocked me out would win $10,000 in cash. Of course, this caused more players to play more pots against me in order to try and bust me. As the day progressed, I steadily built my chips up in a risk-free manner. Whenever I say that I “steadily built my chips up in a risk-free manner,” I’m running my chips up, while playing small pots and keeping myself out of serious risk. After never being all-in all day, and never playing any huge pots, I finally got tangled up in a big pot, late on day 1. With the blinds at $500-$1,000, I raised it up to $2,800 with A-K on the button. The player in the small blind then raised it up $5,200 more, making it $8,000 to go. When I first saw my A-K on the button, knowing that I had been raising it up a lot of pots over the last hour, I was hoping that one of the blinds would reraise me, so that I could move all-in, and they could fold their hand; game-set-match. Was I super unlucky to pick up A-K on the button and run into A-A in the small blind? Yes. Was it an even unluckier situation for me, as I had been raising it up before the flop quite of 10 over the last hour? Yes, because that meant that another player would reraise me with a relatively weak hand, thinking that I was weak. Still, I could have simply folded my hand. One thing that all of the great poker players have is the ability to “Know” (have a super strong read) when an opponent has the best possible hand. There is no other situation quite like it in poker, and the great ones can smell it a mile away. I did smell it, but I did not believe it! So instead of making a great fold, I moved all-in, sigh. I certainly missed a good opportunity to be a super hero. I want to talk about the tactics that I frequently employ in championship-level poker tournaments for a minute. Why do I play super patiently a lot of the time before the flop? Simply because it makes my life a lot easier after the flop. When I play hands like Jd-8d, or 10h-9h, or As-3s before the flop for a raise, I find myself in a lot of unfavorable positions after the flop. For example, I may have the 10h-9h, the flop comes down J-10-4, and my opponent bets out big; now what do I do? I may be in bad shape, like if my opponent has a jack in his hand, or an over pair, or a 10 with a higher kicker (that’s ugly), or the worst-case scenario is that he may have trips. And even if I have the best hand here, my opponent may have K-Q, where I’m only a small favorite to win the pot. Another example is when you have As-3s, and the flop comes down A-10-9. Yes, you have hit the ace, but you cannot play a really big pot from here on out and expect to have the best hand. Now what do you do? Playing these types of hands puts your reading ability to the test repeatedly. On the other hand, there are a lot of top players that do play these types of hands successfully, and when they do hit the 9-6-5 flop to their 8-7, and win a huge pot; they look like geniuses. (Let’s be clear, some of these guys are geniuses!) 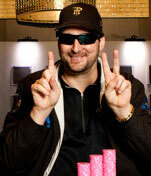 And Patrick Antonius, Daniel Negreanu and a few others seem to play this style of play and win big while using it. So if you do want to play high-level poker and play these types of hands, expect big swings, but the rewards may also be huge. It’s just not my style of play.